Click here for Dr. Helmut Winter's German-language article on this year's Muenster Marathon including a large number of high-quality photos. The day dawning with heavy rain, wind, thunder and lightning, the 12th edition of the Volksbank Muenster Marathon saw the worst conditions in the race's history, but with radically opposing results in the men's and women's races the weather's impact on the race was hard to determine. In the men's race things went out very slow on the twisting roads in the course's first 10 km, understandable given the slick cobblestone surface. The designated Kenyan pacer was more than 10 seconds per km off the target pace of 3:06/km, but still the almost entirely Kenyan lead pack lagged behind. 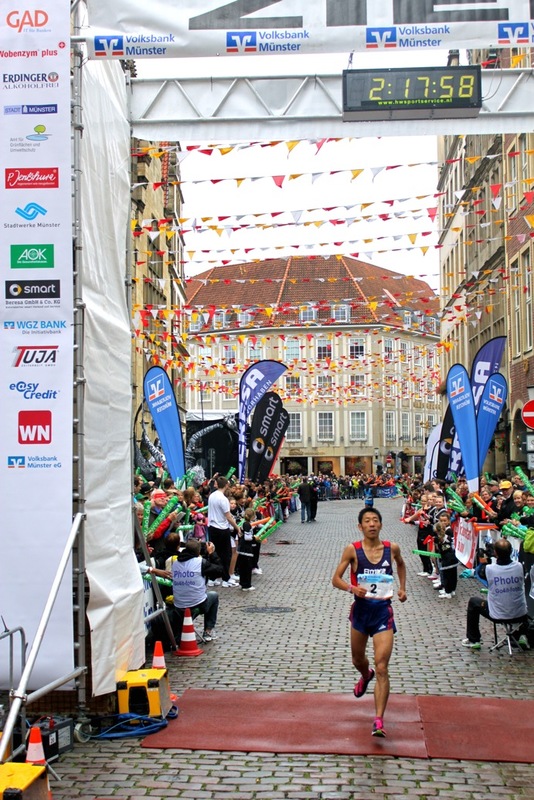 Japanese runners Yuko Matsumiya (Team Hitachi Butsuryu) and Yuya Shiokawa (Team Subaru), in Muenster with support from JRN, gestured for the pacer to run the designated splits but he repeatedly looked over his shoulder and slowed to let his countrymen catch up. Going through 10 km just under 33 minutes and halfway just over 69, things didn't get moving until Evans Kipkorir Taiget (Kenya) threw in a surge around 25 km and another at 33 km. The first broke up the ten-strong pack, while the second opened the race up as Taiget moved clear into the lead. Running unchallenged to the finish, he crossed the line in 2:15:56 for the win, far off the anticipated sub-2:10:25 course record time. Joel Kipsang Kositany (Kenya) was next in 2:16:44. Following a brief pit stop at 37 km followed by a sub-3-minute km to catch back up to the leaders, Matsumiya, the identical twin brother of 5000 m and 30 km national record holder Takayuki Matsumiya (Team Konica Minolta), dueled with Peter Kariuki Wanjiru (Kenya) before inching away to take 3rd in 2:17:58. Shiokawa, a graduate of defending National University Ekiden champion Komazawa University, faded to 6th but rallied after 40 km to run down John Kyalo (Kenya) for 5th in 2:18:41. Matsumiya later endeared himself to the crowd at the award ceremony when he jumped from the stage to present his bouquet of flowers to a young woman in the audience to a roar of approval. The women's race, on the other hand, was a far faster and more focused event. 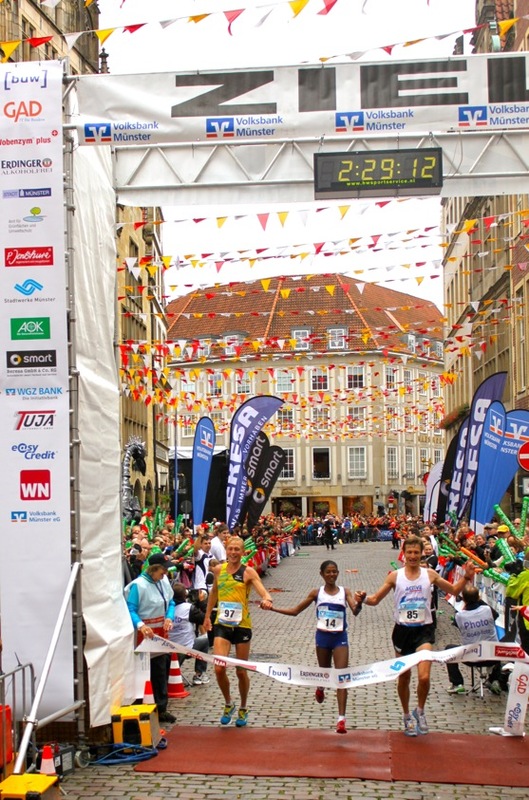 Newly a German citizen, Eleni Gebrehiwot was dead set on a sub-2:30 clocking to get the qualifying standard for next year's European Championships. Running with two male designated pacers, she went out on target and stayed there, grinding down the competition regardless of the conditions and knocking three minutes off her best and five and a half minutes off the course record as she won in 2:29:13. Last year's winner Joan Rotich (Kenya) was also under her PB and the old CR but was a distant afterthought in 2nd, more than a kilometer behind in 2:33:57. The top five all broke last year's winning time, with at least four of the top six setting new personal best marks. Veteran Chihiro Tanaka (AthleC AC) finished just out of the prize money in 7th in 2:43:19, 1st among 40+ women. Winners Taiget and Gebrehiwot post-race. The disparity between the men's and women's results was hard to figure as the men's results were understandable given the conditions, while the same handicap applied to the women's race would make it something truly remarkable. If the overall women's results are taken as only good then the men's are very lackluster and suggest a lack of initiative given the number of sub-2:10 and sub-2:12 men in the field. Chalk it up to poor pacing or the enigmatic flow of a race, and/or to the extra motivation Gebrehiwot brought that powered the rest of the women's field. In any case, Gebrehiwot's performance helped elevate Muenster's profile and hopefully sets the stage for the men to follow suit next year with a sub-2:10 record.